The M48 Tactical Survival Hammer from United Cutlery is the perfect companion for hiking and camping. With a 37 3/8"" overall length, it's great as a walking staff while camping. The cast 2Cr13 stainless steel, black oxide-coated head can pummel almost anything with ease. The cane handle features a defensive war hammer head and a curved back spike, which offers great applications as an effective breaching tool and defensive hammer in addition to being a fully functional walking cane. The 30% fiberglass handle is nearly indestructible, and the axe head is attached to it with metal bolts. Includes a rubber toe on the end of the cane. 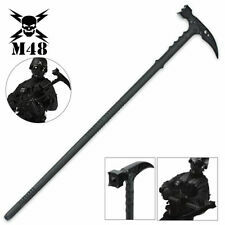 Do you own or have you used the M48 Kommando Survival Hammer Tactical Hiking Staff? If so, rate it! Have you or someone you know purchased or used the M48 Kommando Survival Hammer Tactical Hiking Staff? How did it work? Share with the community!